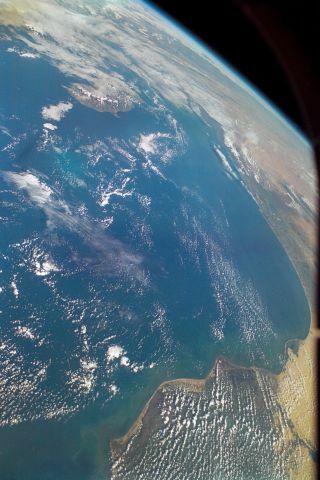 This Earth view featuring the southeastern Mediterranean and northeast Africa/Middle East border was photographed by an STS-107 crewmember onboard the Space Shuttle Columbia. On Feb. 1, 2003, the seven crewmembers were lost with the Space Shuttle Columbia over North Texas. This picture was on a roll of unprocessed film later recovered by searchers from the debris. CAPE CANAVERAL, Fla. -- One day after launch into Earth orbit shuttle Columbia and its seven-member flight crew have settled into a routine of around-the-clock research, and already some of the dozens of science experiments are producing results. For example, a sample of prostate cancer and bone tissue being cultivated in a device called a bioreactor has in 20 hours grown to a size it would have taken a week to reach if the same experiment was being done on the ground. "So far the experiment is going extremely well," said Tom Goodwin, NASA project scientist for the Bioreactor Demonstration System that is part of a cooperative effort with Emory University in Atlanta. In this particular experiment, researchers are growing the tumors to be studied on the ground in an effort to find better ways to prevent or treat prostate cancer before it attaches itself to bone tissue and spreads through the skeleton. "We're looking at the physical and biochemical interaction of those two types of cells which are known to target with one another, or hone to one another, in the human body," Goodwin said. Prostate cancer strikes about 200,000 men a year and is easily cured when diagnosed early, according to the American Cancer Society. Once it spreads to the skeleton it is inevitably fatal and kills more than 30,000 men a year. The public health cost is more than $2 billion a year, according to a NASA fact sheet about the experiment. Altogether there are some 79 experiments planned for this 16-day science mission. "The crew's doing well on the timeline. They look great, they sound great and everybody's extremely pleased with what we've accomplished in the first 24 hours of the flight," said Phil Engelauf, a NASA mission operations manager. The space agency's oldest orbiter lifted off from Kennedy Space Center at 10:39 a.m. EST (1539 GMT) on Thursday without incident, and soon after the astronauts split up into two teams to work a day shift and night shift based on Houston time. That left the Red Team of commander Rick Husband, mission specialists Kalpana Chawla and Laurel Clark and payload specialist Ilan Ramon to finish the work day by setting up the shuttle for its science operations and activating the SpaceHab research laboratory in the cargo bay. A shift change late Thursday came after Mission Control in Houston gave the Blue Team an extra hour of sleep -- something the flight controllers promised was a one-time gift. Following the routine that will continue for another two weeks, the Red Team then went to bed for eight hours before awakening and taking over experiment duty from the Blue Team in the morning. Engelauf said the shuttle and its systems were working well, with only a trio of problems reported. "I would call this an exceptionally clean orbiter so far," he said. One of two heaters in a cryogenic storage tank within the cargo bay wasn't working, and neither was part of an intercom system between the crew cabin and the SpaceHab module. The only trouble of any consequence is with a system that processes data downlinked from the SpaceHab module. Although the communication link with the shuttle's Ku-band system is working well, the experiment data is not being captured on the ground. Engelauf said that until the problem is solved, some experiment data will have to be recorded in the shuttle and played back later. In the meantime, Columbia remains in a stable orbit with plans to land back in Florida on Feb. 1.